The New Music Remix Machine chews up recordings of the New Music community around the world and recombines them in interesting ways, generating new “collaborations." 85 participants submitted audio recordings of pieces they were involved with, whether as performer, composer, recording engineer, or otherwise. Recordings are dynamically combined head-to-head using different techniques, including spectral cross-synthesis, reverb, and random rhythmic looping. The Remix Machine celebrates the stylistic diversity of our community, smashing together musics angular and lyrical, acoustic and electronic, grand and understated — to create a serendipitous snapshot of the New Music community. Czech composer Erwin Schulhoff’s (1894-1942) In Futurum for solo piano (1919) contains only rests in both hands, ornamented by cryptic articulations like question marks, smiles made of slurs, and absurd directions (“play the whole piece with expression and feeling freely, always, to the very end!“). 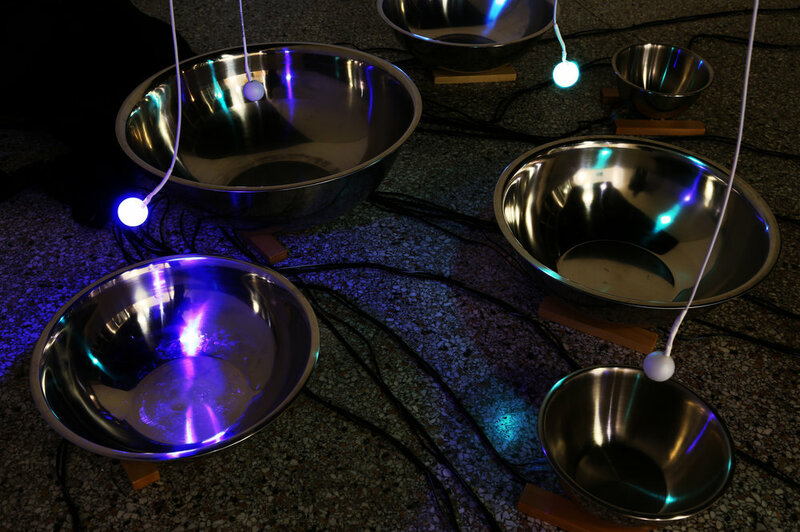 This installation uses light to “play” an interpretation of Schulhoff’s piece, exploring the rhythmic phrasing and counterpoint between the carefully notated rests while respecting its lack of sonic presence. 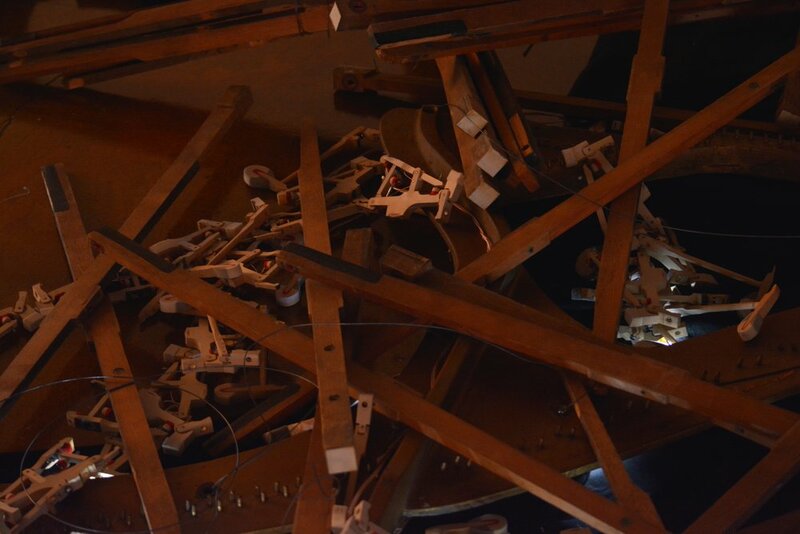 The piano is thwarted as a sound-maker in In Futurum, becoming a boneyard of felt, wood, and wire. Schulhoff’s silent music pulses through the broken instrument, hauntingly alive as rhythmic light. 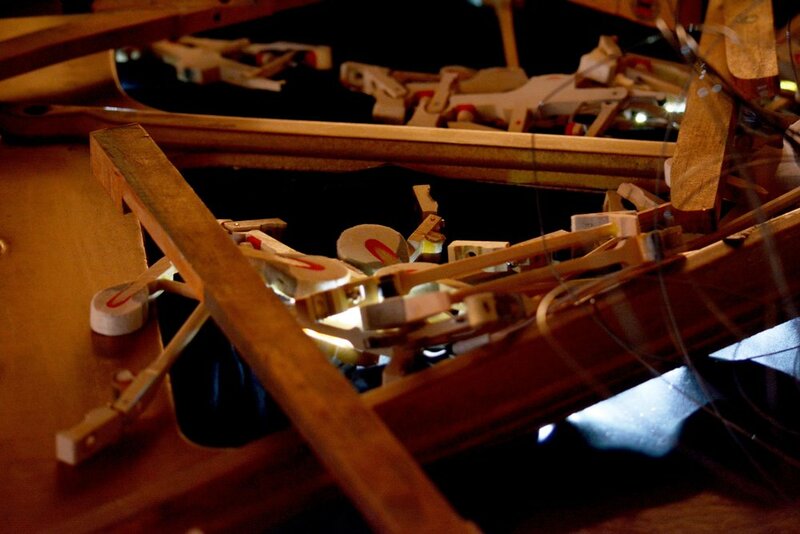 This installation turns inert objects into resonant vessels which sing to themselves. Each steel bowl has a contact microphone and transducer attached, creating a feed- back loop across its surface as the microphone picks up the transducer’s output. 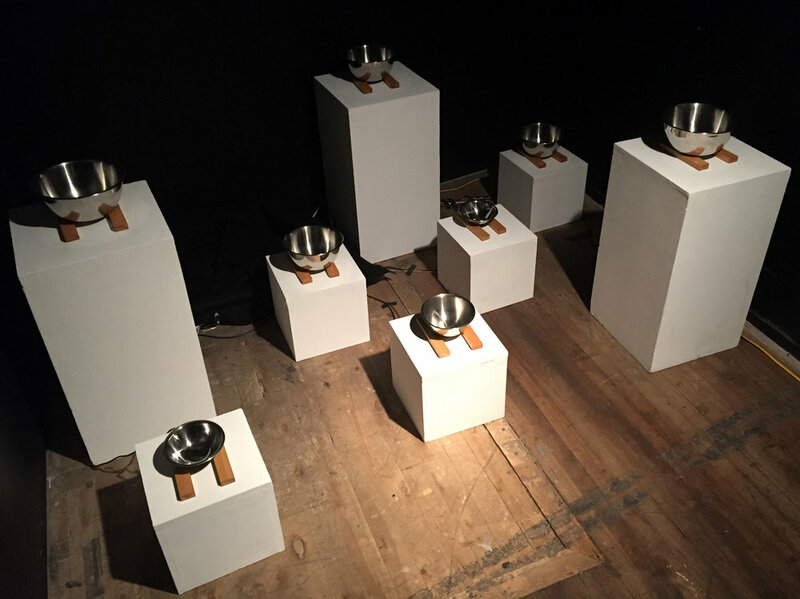 Software listens and adjusts the signal ow, allowing a variety of sonic results to emerge based on the bowls’ resonant frequencies. The vibrations from visitors’ movement may also add slight disruption to this signal chain, magnified by the exponential nature of feedback. chromatic bowls is a 2016 variant that incorporates colored lights. The orb above each bowl responds to its sound, its light colored according to Isaac Newton’s color wheel in Opticks (1704). Newton divided the color wheel into seven segments, each of the pure colors of the rainbow representing a white key on the piano. Just as the singing bowls’ pitches represent a spectrum of microtonal shadings between these notes, so do the colors of the constellation pulsing above it. reversible reaction takes its inspiration from the chemical phenomenon in which reactants and products can form each other, oscillating between two chemical states indefinitely. Two contrasting sonic and visual environments create an abstracted microscopic world in this installation: molecular bonds join and break, atoms float in suspension, and the environment changes when "catalyst" participants who enter the space disturb the system's equilibrium. One of Harry Bertoia's "sonambient" sound sculptures sits on display at Bowling Green State University. However, its resonant tines remain sonically isolated in a courtyard outside the Dorothy Uber Bryan Gallery lobby. This installation imagines that the sculpture has sonic “roots” extending through the window. As the roots creep further into the lobby, a branching generative system stretches recordings of the sculpture in time and pitch. Lamson's Department Store, Artomatic 419! As a group collaborative project, a group of students transformed the window of the former Lamson's department store in downtown Toledo, OH into an immersive, site-specific installation exploring themes of commercialism, labor, and nostalgia. I designed audio played through transducers attached to the window, audible inside and out. I found recordings of television and radio commercials by Toledo businesses, spanning many decades. They play in random order, their nostalgic affirmation interrupted by high-pitched beeps and digital degradation while also cutting across the noisy space of the street and exhibition, constant reminders of the corruptibility of memory and commerce. Sounding Circle is an interactive audio installation: a wishing well, an icebreaker, and a participatory musical machine. When participants enter its space, they are presented with a written prompt that is projected on the wall in front of them. Participants are encouraged to respond thoughtfully to the prompt, speaking into a microphone. Their recorded answer echoes around them, becoming increasingly manipulated by dynamic programmed transformations. Sounding Circle may record participants’ responses, and later replay them unprocessed while users listen to their own transformed recordings. Someone may hear a stranger explain their life philosophy while they listen to their own description of the ideal pizza. Anyone can submit new prompts to the installation by tweeting with the hashtag #soundingcircle. Their prompts will be stored and displayed alongside their Twitter username, so future participants can respond to them. Sounding Circle is meant to foster dialogue and reflection. By hearing their own words repeated and changed, participants consider their responses closely as their voices become less a vehicle for content and more a generator of music. As they stand and listen in the Circle, they connect with others who have also wandered into its space.